From the outset, it was realised that a great deal of fund raising would be required to finance the project and the proposed prominent site would be subject to significant design and planning issues. Then Lieutenant Governor, The Late Air Marshal Peter Walker, was approached and asked to fulfil the role of Patron. On the 1st November 2013, His Excellency agreed to undertake this role. 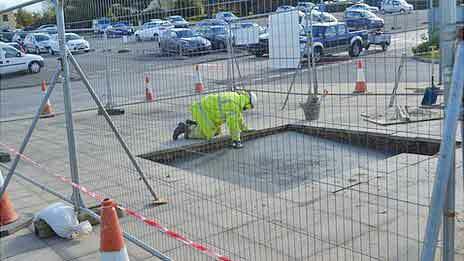 Before they had completed their work on improvements to the airport’s taxiing and runway surfaces the contractors Lagan UK undertook the provision of foundations on the position that had been chosen for the eventual Memorial. They completed this work free of charge. Pro bono number 1. On Monday, 18th November 2013 the AAM Committee organised a Dedication on the site. Reverend Mike Keirle conducted the short service, attended by our Patron, the Lieutenant Governor and military veterans. We were under way! Meanwhile, with mounting enthusiasm, Pat Johnson approached Create, a local Chartered Architects company, With the indefatigable good humour of the Irish, Pat (who is half Irish) asked the Create team if they would act as lead consultants in designing a contemporary memorial to honour those Allied aircrew who died in Bailiwick waters during WWII. AAM wanted to move away from a traditional memorial design and asked Create Architects to explore something more fitting for its location based on certain parameters. These were to remember the deceased aircrew from 6 nations, but an obelisk was not a favoured design; it had to complement the modern design of the Airport Terminal building and incidentally “would they mind doing this free of charge?” They accepted the challenge without question. Pro bono number 2. In a very short time Create submitted its draft proposal to the Committee. This was based on recreating a squadron of Spitfires and a Lancaster bomber, flying in formation at differing heights suspended at high level. Curved steel poles were designed to support the solid stainless steel aircraft but also to evoke a sense of motion and encourage the viewer to look heavenward providing a religious connection. The planes were to be designed with basic detail as a representation, (not intended as true replicas) and made to be detachable for cleaning purposes. Meanwhile discussions were also taking place between Pat and Colin Le Ray, Director of Guernsey Airport on the floral plans. 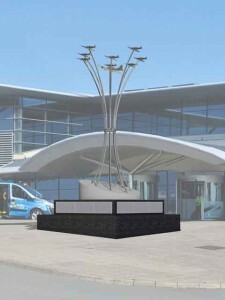 As well as being happy with the Floral Guernsey concept to upgrade the floral display on the frontage of the Terminal building, he also gave his support to enhance the planting with a suitable memorial for the fallen airmen. Guernsey Gardens were fully engaged in the discussions and a grand plan for the whole area was devised. The inaugural meeting of the Allied Aircrew Memorial Committee took place on the 6th January 2014. At this meeting, the priority was to decide upon a design that would honour the aircrew and match the modern exterior of the terminal building. The Committee considered a number of concepts amongst which was the design submitted by Create. The concept of Create’s design was unanimously accepted as the preferred option by all the Committee members. Two or three granite bases that could be inscribed with names of each individual and at which wreaths could be laid at future Remembrance parades. Finished height of around six metres in material commensurate with the style of the Terminal Building. Incorporate stylised aircraft of the period. Robust design to withstand wind speeds of 80 mph. The finished memorial had to be constructed from local materials by local craftsmen as far as was possible. The team at Create rose to the challenge. Their concept design had been enthusiastically received by the AAM Committee but there were many engineering issues that needed to be resolved. For this, the Committee relied upon professional advice from Nick Barton of CBL Consulting. The next step was to present the proposal for planning consent. With this is mind, Paul Staples attended a number of meetings with officers of the States Planning Department and representatives of the Arts Council. A site for the memorial was identified by the Airport Authority and the Planning Department and permission to lay the foundations was granted. The work required for these foundations was carried out by Lagan and Ronez. Both companies provided their services and materials free of charge as their contribution to the Memorial – the first concrete (excuse the pun) pro bono! A green square of Astro-turf was the only visible sign of the work in hand. At this point, we did not know the form of the finished memorial. However, as is customary with military protocol, the foundation was blessed in a simple ceremony on Monday 18th November 2013, conducted by Rev Mike Keirl and at which the Lieutenant Governor laid a wreath.